I don't think I've ever been been this excited about a globe in my life. Don't get me wrong, globes are great, but according to the folks over at Sky & Telescope Magazine, we've just reached a major milestone for Moon globes — what they claim is the first major update to a physical lunar likeness in more than forty years. Have you ever seen a globe of the Moon? If you have, it probably looked a lot like the one on the right in the image up top. Well, it turns out that this lunar representation is outdated. 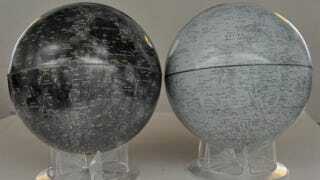 According to Sky & Telescope, most Moon globes don't actually "show the real Moon." Instead, writes S&T's Kelly Beatty, versions like this one from Replogle Globes are just airbrushed maps, "derived from the U.S. Air Force's Lunar Astronautical Charts." Make no mistake: the LAC series was meticulously compiled and executed. But Replogle's adaptation doesn't look anything like what you'd see in the eyepiece - there's little distinction between the dark lunar maria and the brighter highlands, for example. That old globe, while serviceable, just wasn't satisfying. So for years I've been prowling around for a suitable database of lunar photos to make a new one. The Clementine orbiter, launched in 1994, got pole-to-pole coverage, but its images lacked enough resolution and snap. Then came Japan's highly successful Kaguya spacecraft, which orbited from 2007 to 2007, but its images had issues with coverage and lighting angles. Eventually, the Lunar Reconnaissance Orbiter Camera, launched aboard a NASA spacecraft in 2009, made this new Moon globe possible. You're probably familiar with LROC's high-resolution views of the Apollo landing sites. But it's the camera's wide-angle channel that really caught my attention, as evidenced by this half-gigabyte portrayal of the lunar near-side. For the last year, Beatty has been working with Mark Robinson (leader of the LROC team), USGS cartographic specialist Trent Hare, imaging editor Sean Walker and others to create the next-generation of lunar globe from Lunar Reconnaissance Orbiter data. Pictured here is the final product. It's 12 inches in diameter, dark (just like the real Moon), labeled with 850 well-known features, and wrapped in "magnifying-glass detail." After reading through Beatty's account of the time and energy that went into bringing this globe to fruition, it's clear that they poured a lot of effort into making this thing awesome. I, for one, can't wait to get my hands on one. Read about how this new globe came to be over on Sky & Telescope.